Cat 5e Network Patch Cable offers universal connectivity to computers and network components, such as routers, switch boxes, and network printers, network attached storage (NAS) devices, VoIP phones, and PoE devices. 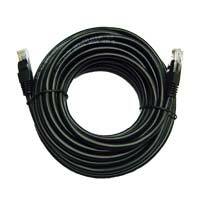 Patch cables are available in various different colors and in various lengths. Color-code, customize, and organize your home or office network. Perfect for networking across longer distances or providing access to locations that cannot otherwise receive a wireless signal.